Brenda Beanblossem of the Locust Creek Resource Center in Carlinville, an adult protective service program, was Tuesday's guest speaker at the weekly meeting of the Taylorville Kiwanis Club at the Taylorville Memorial Hospital auditorium. Locust Creek has had a contract with the state to work on senior abuse cases in Christian County, for some 25 years. In 2013, the state changed their scope of services to include disabled people between ages 18 and 59. 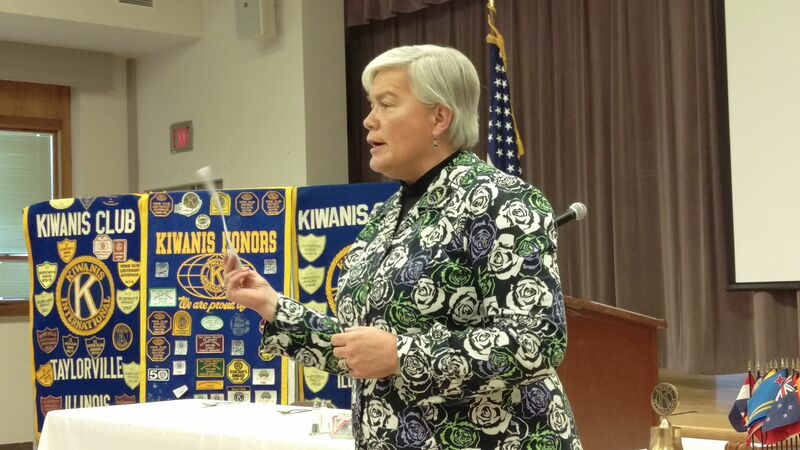 Beanblossem told the Kiwanis Club that her agency investigated some 212 abuse cases in Macoupin and Christian Counties in 2015, with 40 of those cases involving adults under age 60. She added her agency isn't authorized to investigate nursing home or assisted living abuse cases, which come under a different state agency. She added her agency concentrates on physical, sexual, and emotional abuse of senior citizens, along with confinement, passive neglect, and financial exploitation cases. Beanblossem said financial exploitation cases make up the majority of cases they investigate. Cases can be reported anonymously and she credits the assistance of area police agencies for their help when needed.